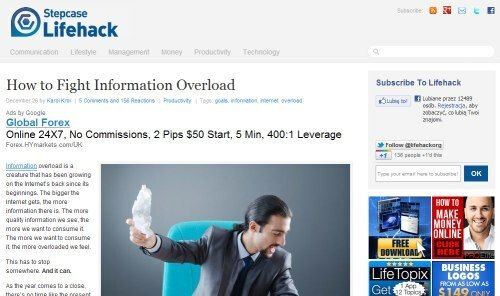 To put it in a sentence, information overload is a true plague nowadays. And I really mean it. I truly think that the amount of information available on the internet these days is a bad thing. There’s a page on any topic imaginable. In fact, I would even risk saying that if you can’t find something on the internet then it most likely doesn’t exist. OK, but why is it a bad thing? Because it’s simply paralyzing. Whenever you’re searching for something on the internet the problem isn’t that you can’t find it, the problem is that there’s too much information available, so you can’t stop searching … you know that there’s always something else waiting on the next page. Having the confidence and knowing when to stop searching for something and using the information you already have can be a skill difficult to develop. Feel free to share your own ways of fighting information overload and not letting it take over your life.